Description Spiral Division (Facts Only) Math Fact Worksheet: Tired of the same old division fact worksheets with rows and rows of problems? Time to try something unique. 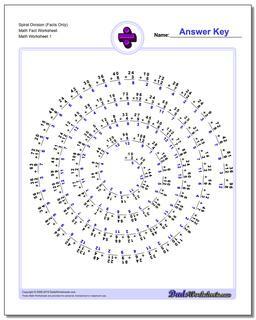 These worksheets present the division facts in a spiral layout that provides fun a twist on memorizing the fact tables. They use the same fact layouts as the spaceship math sheets above, so try the first two sets worksheets if you are looking for the full set of multiplication facts or practice without the easier problems, or look at the others for an incremental approach to learning the facts.